Like a tumble-weed rolling by in the scorched desert of the southwest I allowed Across Tundras' 2011 release Sage escape me entirely. By placing Sage at his number three spot of his year-end list Toby graciously reminded me that Across Tundras was not a band to be missed or a sound to be taken lightly. His July 2011 review praised the quirky combination of the country twang trickling from the guitar and the doom paced trudge of the rhythm section. This begot a sound which I can only describe as the soundtrack for the traveling lonely en route to desolation. Heeding my Heavy Planet sensei's call, I chose not to let Across Tundras latest release, entitled Electric Relics, escape me. Now, having patiently experienced both releases I am conscious of the isolation Sage brought and how well Across Tundras have aged with the achievement of Electric Relics. Bounteous in Classic-Americana, Tanner's signature crooning lead us down the desolate trail. There is still a very heavy side to what Across Tundras is doing, strongly influenced by doom and traditional heavy metal, but shrouded by years of weathering. Here on Electric Relics I sense a stronger influx of a hardened style of Alternate Country, still holding onto that Americana swagger. The kind of swagger that comes from a life-style of swingin' pickaxes and sledgehammers and having just enough energy to hold your head up at the end of a sixteen plus hour day to down an ice cold beer. Across Tundras create, what may be, one of the most difficult styles of music a writer must describe. Truly a genre of their own. Although it may sound straight forward... a simple combination of country and doom... there is so much more to this band and more specifically this album. The trio toy with loads of experimental psychedelia and, what sounds to me, as interesting time signatures (although I know absolute jack of musical method, structure and time signatures). Take for instance the track Driftless Caravan. Tying together a gallop of percussion and clanging brass, Across Tundras inject a toxic RIFF that gives Driftless Caravan the sensation of a flat tire. By that I mean that the instrumentation always seem to be cycling, but at the same time attempting to catch up to one another. Like everything is in time, but it isn't... Simply intoxicating. Although, the song that truly sums up the Across Tundras experience for this listener is track number six Castaway. With a trickle of that southern sweat Tanner's guitar weeps in excruciating loneliness as Castaway's heartbeat. A few taps of the brass and the rhythm section step in to build on the immensity of Tanner's RIFF. Castaway roams this repetitive path to the point of exhaustion where the tempo slows creating a climatic apex with the reflective lines, "Was it all just a dream... Is anything really what it seems? Nobody knows." And with that moment Castaway changes its course with an uplifting progression for higher land. 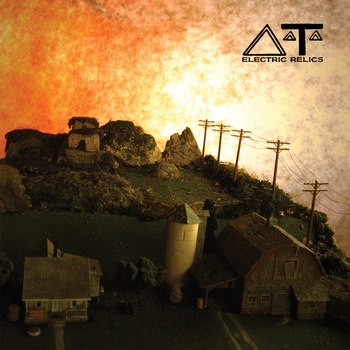 Electric Relics is the perfect follow-up to their 2011 release Sage and the ideal theme for a strong man broken by the mundane and pains of the hard life. Spin Castaway below and get a vinyl copy at Across Tundras web-store. Looking for a fresh take on classic heavy metal? Look no further than Portland, Maine's Whitcomb. Not only does this quintet recreate that classic heavy metal sound, they do so injecting loads of melody making for an euphonious, albeit heavy, experience. 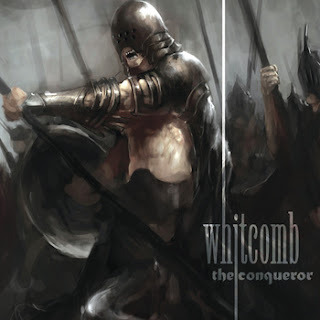 With a blazing fifteen minute run-time Whitcomb's latest endeavor, The Conqueror, rushes your senses with a twin guitar attack backed up by some towering vocals. Heroically surging over the mix, Brant Dadaleares vocal ability is a pivotal characteristic for Whitcomb and their style of melo-metal (not to be confused with mellow). The band open The Conqueror with a juicey RIFF-FEST entitled Blind. Within thirty seconds you will be overcome by Brant's soaring singing, all the while the RIFFS continue to build up Blind. Herein I also find the drumming from Mark Sayer noteworthy. The clash of the cymbals to the rolling thunder hidden below the ascending guitars and vocals compliment and refine the three minute forty second, radio friendly song. Whitcomb do slow things down for the ballad-like To A Skull. However, in the end expect their signature melodic rush throughout The Conqueror. Check out the official video for Blind below or get your copy from bandcamp or iTunes.